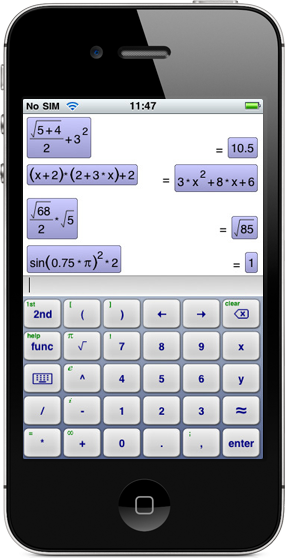 The perfect math app with full-featured algebra capabilites on par with high-end scientific calculators, ideal for high-school or college students, engineers or anyone needing a powerful math toolbox. 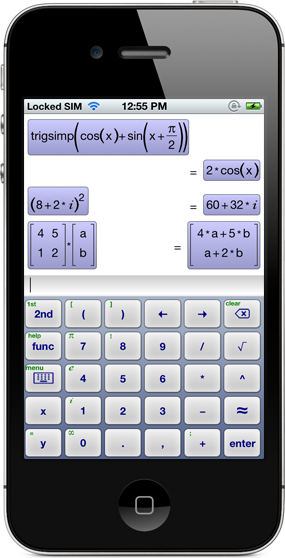 Even if you are using just a fraction of the functionalities, the iphone-ish, easy-to-use interface makes life much easier compared to traditional calculators. the basic concepts of the user interface. Arc sine. Result is in radian or degree depending on the selected trigonometric mode. Arc cosine. Result is in radian or degree depending on the selected trigonometric mode. Arc tangent. Result is in radian or degree depending on the selected trigonometric mode. Arc cotangent. Result is in radian or degree depending on the selected trigonometric mode. Binomial coefficient. Needs two parameters (n,k) , returns the number of k-combinations from a set with n elements. The least integer greater or equal to the given argument, if it is numerical. Characteristic polynomial of a matrix. First argument is the matrix, the second argument (which is optional) is a symbol. With only one argument the result will be a polynomial of x.
Clears any assigment previously made for the symbol given as the only argument. Number of columns in the matrix given as the single argument. Conjugate of a complex number. Cosine. Argument expected in radians or degrees depending on the selected trigonometric mode. Cotangent. Argument expected in radians or degrees depending on the selected trigonometric mode. Computes the derivative of a function. First argument is the function, the second one is the variable. 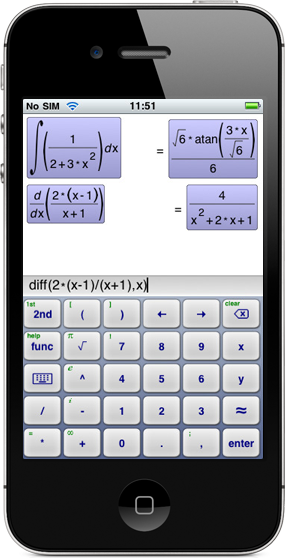 Third argument is optional, it determines how many times the function is differentiated. Dimension of the vector given as the single argument. Works both with row and column vectors. 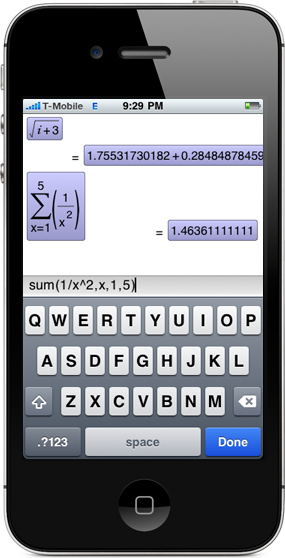 For matrices use the coldim and rowdim functions. Division with remainder. First argument is the dividend, second one is the divisor. The result consists of the quotient and the remainder. Arguments can be numbers or polynomials. Factorial of an integer number. The greatest integer less or equal to the given argument, if it is numerical. Prime factorization of an integer number. - 1. The expression to be transformed. Imaginary part of a complex number. The 3rd and 4th arguments can be omitted. In this case you get the indefinite integral. - 2. Variable of the function. - 3. The point of limit. Natural logarithm. Has exactly one argument. Logarithm. Has two arguments, second one is the base. 10-based logarithm. Has exactly one argument. Minimum of the arguments. Can also take a matrix or vector as an argument, in this case it returns its smallest element(s). If some of the arguments can be compared, more than one of them may be returned. Maximum of the arguments. Can also take a matrix or vector as an argument, in this case it returns its largest element(s). If some of the arguments can be compared, more than one of them may be returned. Returns the next prime greater than the integer argument. 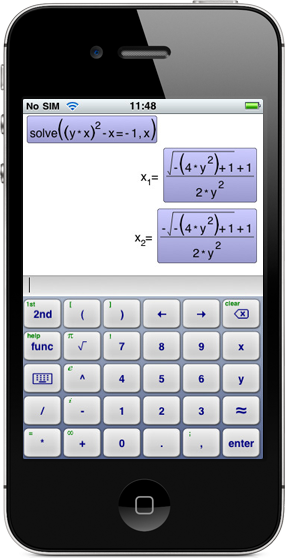 Returns an approximate solution of an equation, or a system of equations. Arguments are the equation(s) and the variable(s). The number of equations must be equal to the number of variables. Only one solutions returned. When solving a single equation, an optional third argument can be the starting point of the Newton method. Solves an ordinary differential equation. First argument is the equation, second is the function to be found, third is the independent variable. Partial fraction expansion. First argument is a fraction of two polynomials, second one is a variable. Returns the list of partial fractions. Returns the m matrix pivoted about the element in row 'r' and column 'c'. Random number. Returns a non-negative integer that is smaller than the argument. The value is drawn from a uniform distribution. Rank of the matrix passed as the only argument. Real part of a complex number. Roots of an expression. First argument is the expression, second one is a variable. Will returns the values of the variable where the expression is zero. The nearest integer to the given argument, if it is numerical. Number of rows in the matrix given as the single argument. The sign of the argument if it is numerical. Returns -1, 0 or +1. Sine. Argument expected in radians. Solves an equation, or a system of equations. Arguments are the equation(s) and the unkown variable(s). There must be at least as many variables as equations. Substitutes part of an expression by the given rule(s). First arguments are the rule(s), last is the expression. Tangent. Argument expected in radians or degrees depending on the selected trigonometric mode. Returns the transpose of the matrix given in the argument. Trigonometric simplifications. Needs one argument which is the expression to be simplified. Vector dot product. Arguments must be two vectors with the same size. 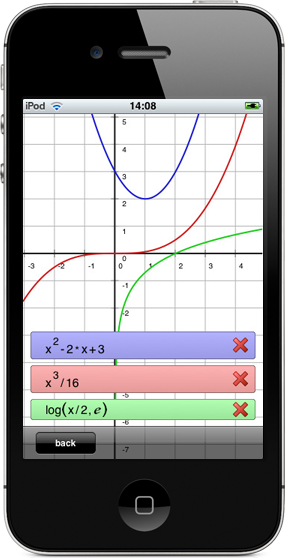 Vector cross product. Arguments must be two three-dimensional vectors. If you have any questions, problems or ideas about the application, feel free to contact the developer. Filling out the e-mail field is optional.